See your video questions on "Larry King Live," 9-10 pm ET Monday-Sunday. Want to send us your question for Larry’s guest on video? 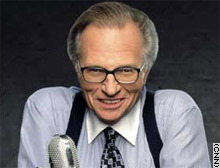 Fire up your camera and send your questions to "Larry King Live". If you need help shooting video check the Toolkit for a box full of tips from CNN experts. Please supply your first name. Please supply your last name. Please supply your phone number. Do you have a file to send? Upload it here. If not, leave this section blank. File type: MP3, WAV or AIFF Tell us about what you're sending. Be sure to describe your material as completely as possible -- it's important to include specific details that answer the questions who, what, where and when. Please select the country your media was created in. Please select the month your media was recorded in. Please select the day your media was recorded in. Please select the year your media was recorded in. Upload is in progress. Please do not close your browser, or browse away from this page. To cancel the upload press your browser's stop button.